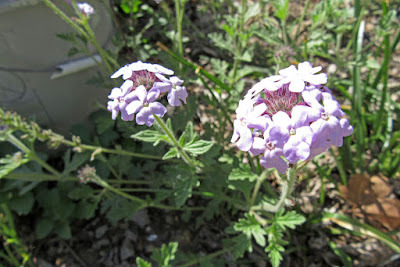 Desert mock verbena is a good example of a desert plant that can transition to a garden setting. In fact, we’ve planted several in Mother Nature’s Backyard this year. While it normally blooms a bit earlier, it’s such a pretty addition we chose it as our Plant of the Month. 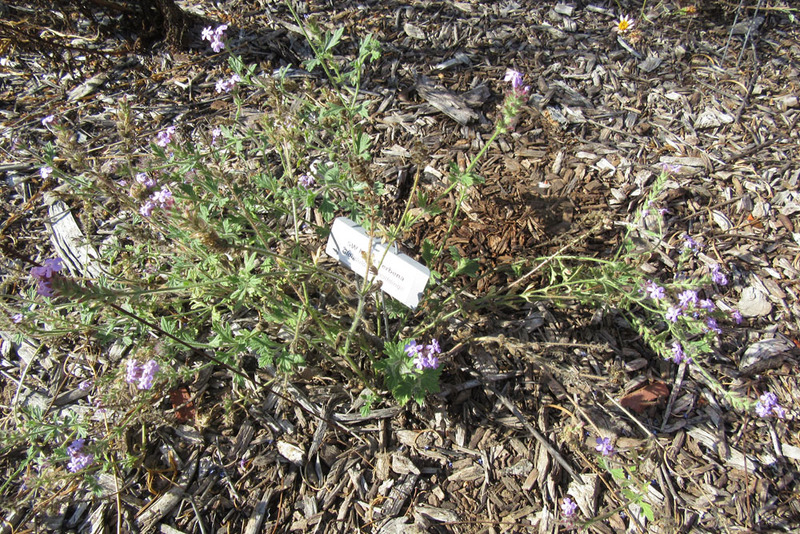 You may want to look for it in the fall native plant sales. Glandularia gooddingii is native to the eastern Mojave and northern Sonoran Deserts from Southwestern Utah and New Mexico south to northern Mexico. In California, it’s limited to the desert mountains of eastern San Bernardino County. The common names for this plant reflect its Southwestern desert origins: Southwestern mock vervain; Southwestern vervain; Goodding's verbena; Mojave verbena. The scientific name honors Leslie Newton Goodding (1880-1967), a botanist and educator who collected extensively in the American Southwest, particularly in Arizona. Another well-known native plant that bears his name is the Goodding’s Black Willow (Salix gooddingii). The scientific name is pronounced: glan-doo-LAIR-ee-uh good-DING-ee-eye. 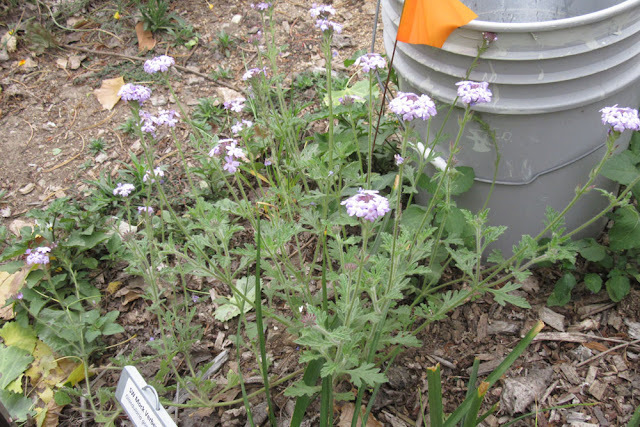 Desert mock verbena is an herbaceous perennial. It grows only 1-2 ft. (30 to 60 cm.) tall and 2-3 ft. wide (1 meter). The overall form of the plant is mounded to spreading. 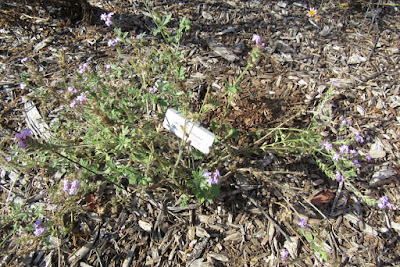 In fact, the species is often used as a groundcover in suburban desert gardens. 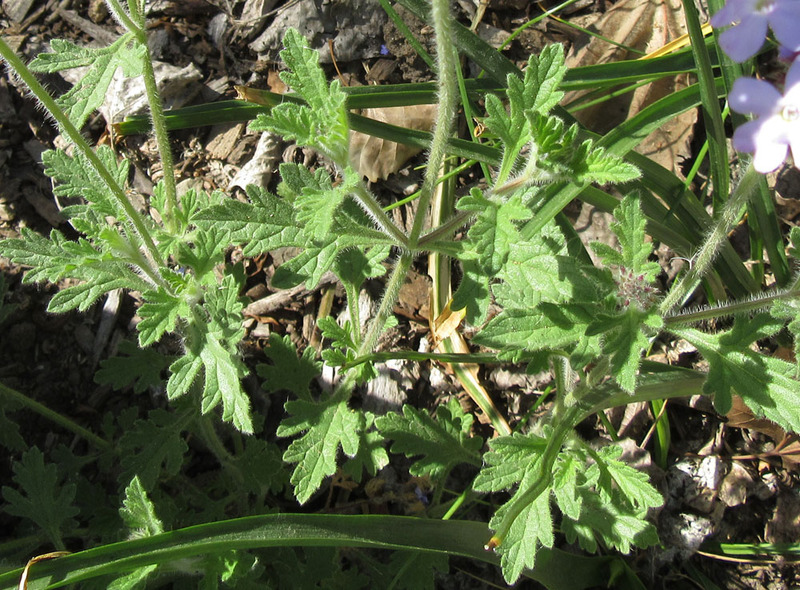 The stems are slender, square and hairy. The leaves of Glandularia gooddingii are medium green and also softly hairy. Their shape is variable, ranging from lobed to coarsely toothed. As seen in the photo, above, the leaves often have three lobes that are deeply incised or roughly toothed. The overall effect is lacy green foliage from late winter to early summer. In the wilds, plants become dormant during the hot, dry summer. Since our plants are young, we’ve given them a little summer water this year to get them established. So ours remained green a bit longer. 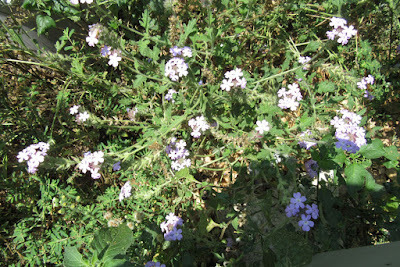 Gardeners like Desert mock verbena for its verbena-like flowers. 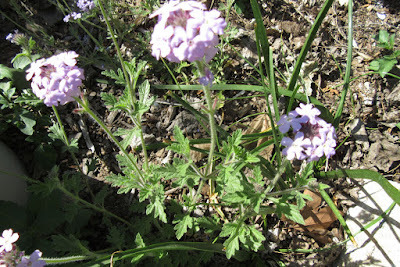 If you favor the looks of verbena or lantana, this is a native to consider. In its native setting, Glandularia gooddingii typically blooms from April to June, though it may bloom outside this window depending on summer rains or irrigation. 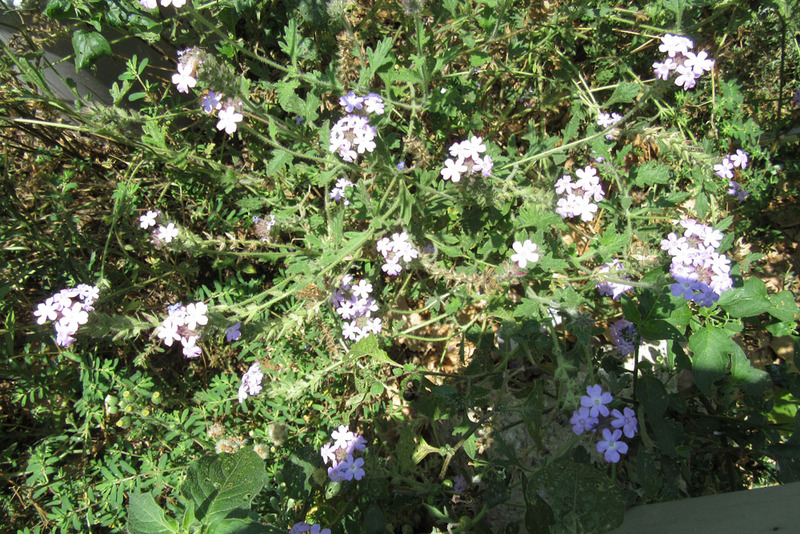 The flowers are lilac-purple, pale pink or white. Individual flowers are 1/2 inch (1.3 cm) wide, with five petals fused to form a tubular corolla. Flowers grow in dense clusters on stems above the foliage. The effect is charming and quite showy; plants will sometimes appear literally covered in blooms. The flowers attract butterflies and hummingbirds – yet another benefit. Glandularia gooddingii can be grown in any well-drained soil. It thrives in full sun to part-shade and needs no fertilizer unless grown in a container. We suggest planting this species in fall or winter, then giving it winter water if nature doesn’t provide. Plants look their best with occasional summer water – perhaps every 2-4 weeks from June to August, depending on soil and temperatures. It’s important to let the soil dry out between waterings; plants can succumb to root rot in all but sandy soils. Desert mock verbena is a short-lived perennial; perhaps 3-4 years is common. But if happy, it will reseed on bare ground, keeping you in plants for years to come. Some gardeners deadhead flowers immediately to lengthen the flowering period. We advocate waiting to deadhead flower stalks after seeds have spread (or been eaten by birds). That’s really about all that’s needed in terms of management. 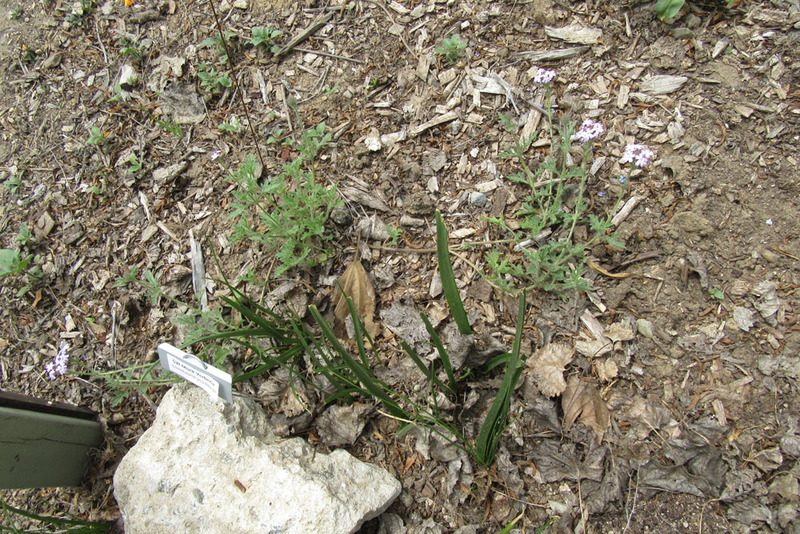 Like most native perennials, plants will die back naturally in fall. Glandularia gooddingii is one of those interesting native perennials that give native gardens their special charm. It can be massed as a flowering groundcover or grown in a large container or rock garden as an accent. It’s a good companion plant for desert species like Baileya, Larrea, Ambrosia, and Penstemon species. The unique flowers and foliage also combine well with coastal S. California native shrubs and grasses. We like to place it along walkways and at the front of flowering beds, where it attracts butterflies and birds. If you’ve been toying with including some desert natives in your garden, this is a great plant to try.